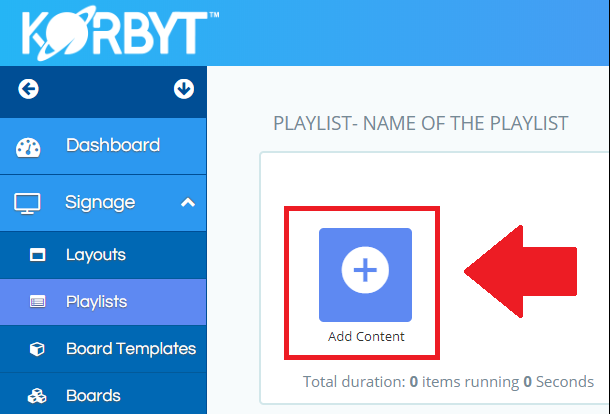 Playlists are one of two ways to publish content to a player in Korbyt. They consist of a list of Images, Videos, Layouts or KorbytGO Messages that play in the order you arrange them, for the amount of time you assign to each one. From your Dashboard, click on the Signage section on the left hand side. Now that the Signage options have been expanded, click Playlists. Click Add Playlist in the top left corner. Fill out all of the options needed, they are explained below. Playlist Name – This is what the playlist is called. This should be descriptive. Default Animation – Between the time a piece of content stops playing and the next one starts, we can have a transition to make it look smoother or more playful. Whichever transition is set here will be automatically assigned when you add content to a playlist. Individual transitions can be changed later. You can also change the default later, if desired. Override to play full video – When checked, this overrides the duration setting to play videos full length. If unchecked, you may choose how many seconds videos can play, starting from the beginning. Interrupt Play – When this is checked, it will cause this playlist to stop other content that has been scheduled to run during the same time and play this playlist instead. Default Duration – This is the number of seconds an image or layout will display for when it gets played from the playlist. Individual durations can be changed later. You can also change the default later, if desired. Number of items per loop – This is the number of items in a playlist that will be displayed when the KDA plays this playlist. All plays everything in the playlist. Description – This is a helpful description of the purpose of the playlist. You can type anything you like. It can be a handy way to let other team members know what they should and should not place in the playlist. You can see the description for each playlist if you use the ‘List’ view. 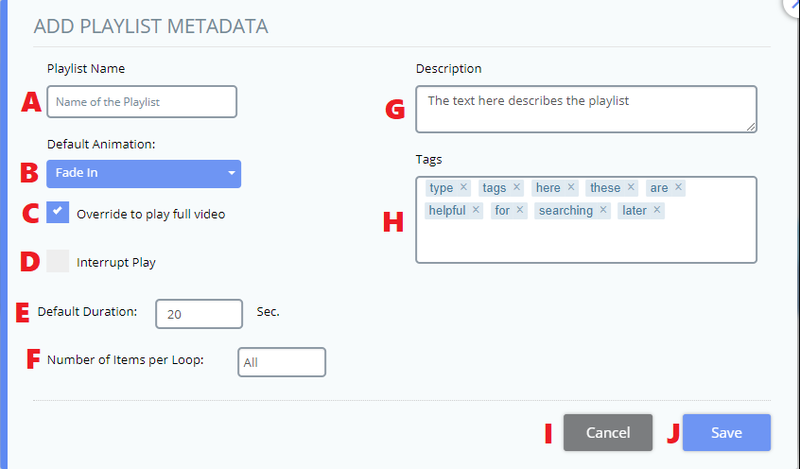 Tags – These are descriptive words that can later be used to search and find the playlist. Cancel – This stops the creation of the new playlist and takes you back to the playlists view. Save – This saves all of the information you have entered on this screen and lets you begin adding content to your playlist. 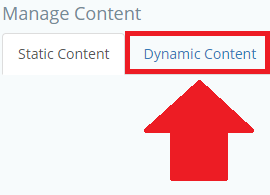 There are two ways you can add content in Korbyt, Static or Dynamic. Static content means that you choose exactly what content is going to play, in what order, and how long each piece will play for. Static is the default. If controlling the time on screen and order of content is important, you will want to make a static playlist. Dynamic content allows you to choose any content that has tags on it that you choose. If you add content to your media library that has that tag, it will automatically begin playing on players with the Dynamic Playlist. Likewise, if you remove content from your Media Library that has those tags, it will automatically stop playing on any player that has the Dynamic Playlist. With a Dynamic Playlist, you cannot pick the order the content plays back in or choose different amounts of display time for each individual piece. The content plays in a random order and all images play for the playlist default. You will now be presented with the Playlist editor screen. Click Add Content to add images, videos, or layouts to your playlist. The first thing you see is that you can browse all of the images in your Media Library. The other options you have are explained below. Media Library – This dropdown lets you choose the source of your content. 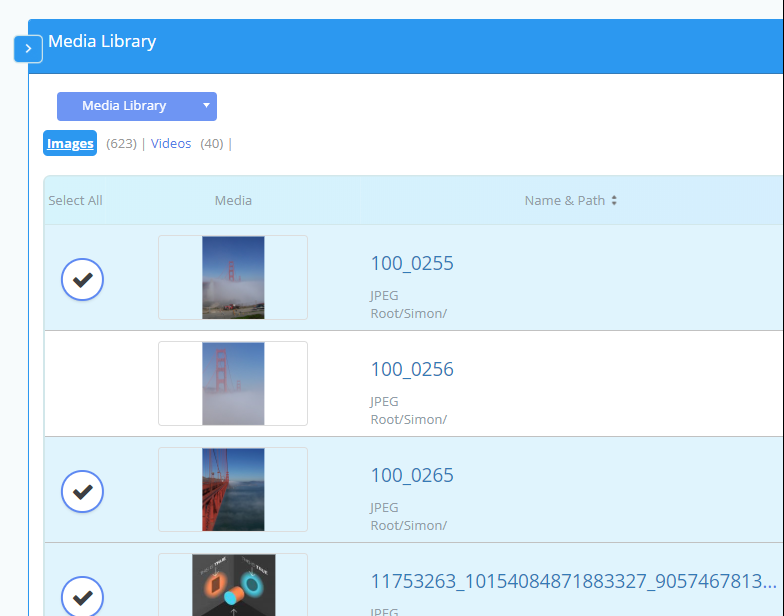 You can choose Media Library (image/videos), Layouts, or Messages. Videos – Clicking Videos shows you the videos in your Media Library. Select All – This selects all of the visible content in the list, so you can add it all at once to your playlist. Folder View – This changes the way the list of content looks. It will allow you to navigate your Media Library in a folder structure, rather than just an alphabetical list. Filter by Tags – This lets you narrow down your list of content by searching for tags. Search – This lets you search for content by name. Once you have found the content you want to add, click anywhere on its line to select it. This puts a checkmark to the left of it to let you know it’s going to be added. You can select multiple items by clicking the first item, hold down the shift key on your keyboard, then click on another item to select everything between those two. If you only wanted to select the first and last items, you can click on the first item, hold down the CTRL key on your keyboard, then click the last. Once you have selected everything you want added, scroll to the bottom the click the Add button in the lower right hand corner. Select Dynamic Content in the top left corner. The results will show below the search box. If you don’t get any results, this means there is currently no media in your library with this tag. Click the select button next to the tag you would like your Playlist to use. To the right, any tags you have selected for use in this Playlist will be shown. You can click the trash can icon to take them off your Playlist. If you are finished, you may now click Save to save these tags. Type the tag and press enter. You will see it now shows under Selected Tags. Now that you have content in your playlist, we can assign it to a player or a board. If this playlist is going to be in a board, please see How To Create A Board without assigning any players or groups. 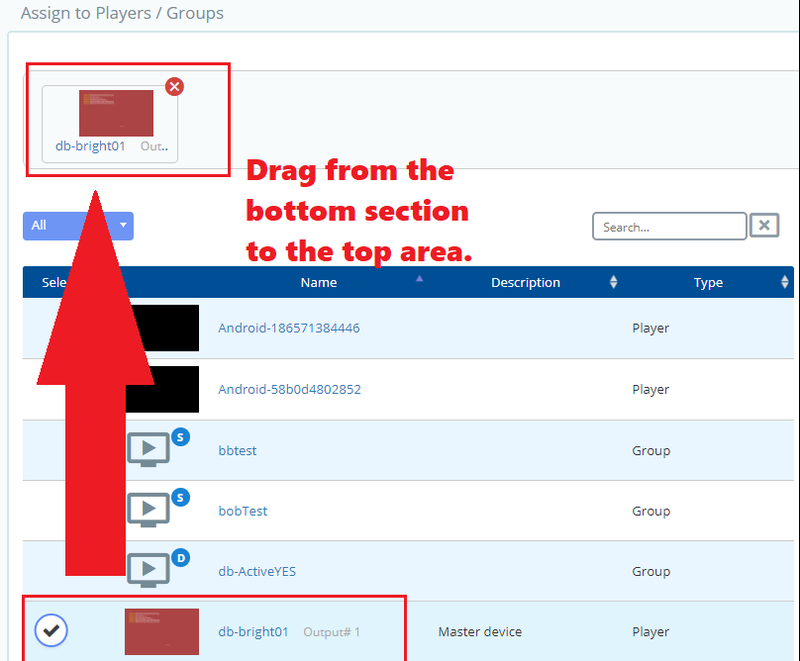 To assign directly to a player, you can find it in the player list in the lower left hand corner of the Playlist Editor, then drag it to the Assign to Players / Groups box, below the playlist area. You may have to scroll down to see the player list. 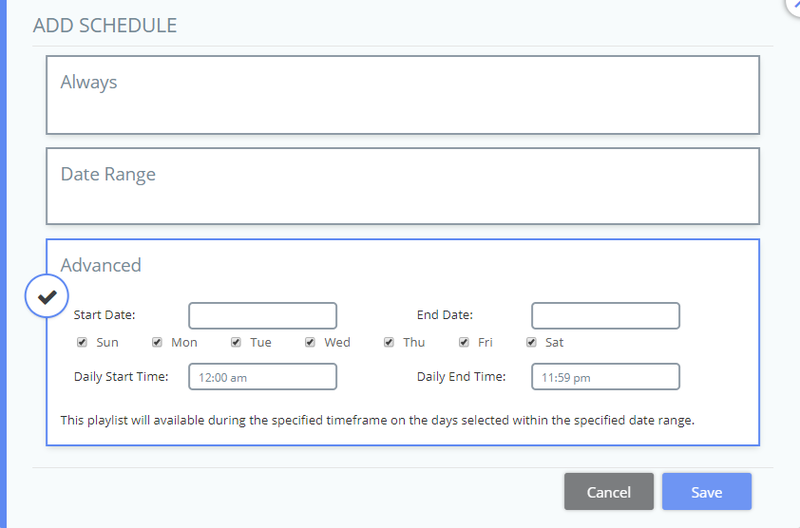 Click the Plus (+) button next to the Word Scheduling in the lower right hand corner. Now you are nearly done! You can scroll to the bottom of the page and click Save Playlist to save it and publish to a player, if one was selected.